Goodall and Collings changed the game for me . . . Discussion in 'Acoustic Instruments' started by justonwo, Sep 28, 2008. About a year ago, a Gibson SJ-200 got me started on a quest for an acoustic. I've never really paid much attention to acoustics, focusing most of my time on my electrics (especially when I had a band). Now that I have a baby and have left my band behind after a recent move, I've been taking looking for an acoustic more seriously. So I started with the majors - Gibson and Martin. And, yeah, they were pretty good for the most part. But I finally got to try a Collings today (a D2H) and it absolutely blew my socks off. It's just in a whole class of its own. Same goes for the two Goodalls I played (a Standard and a Traditional). I had never heard them before, but as soon as I tried them I knew they were in the same class as the Collings. Just fantastic sounding guitars. I've kinda left Gibson and Martin behind at this point. Any suggestions from you Collings/Goodall guys on specific models that are must-hears? I am still looking for a Goodall...sublime instruments. Collings D1A is a nice axe. The CJ ain't bad either. especially for Gibson fans. My current favorite is my Collings OM2HA. I've owned instruments from both Goodall and Collings. There are lots of great builders out there that are worth investigating. Don't overlook Martin and Gibson, as they do occasionally hit one out of the park. I think you must try their 12 fret models. The traditional 12 fret construction puts the bridge closer to the center of the lower bout where it just creates a tremendously dynamic & powerful guitar. Ironically, its just the opposite of the super-jumbo. I've never had the opportunity to try the Collings, but my Goodall traditional 12 fret 000 is just a killer. Very Cool! As far as suggestions those guitars you mentioned Collings and Goodall are fantastic instruments. I have a Goodall CJ Goose Spruce that is one amazing acoustic guitar. About 5 years ago, I went to a shop to try out a Martin and ended up buying a Goodall Grand Concert with Koa back and sides and an Adirondack Spruce top (Goodall KGC). It was the sweetest sounding and feeling guitar in the shop! The store was Maple Leaf Music, a small, independent retailer of fine acoustics, in Brattleboro, VT. They carried Martin (not a Martin dealer anymore, though), Huss and Dalton, Collings, Froggy Bottom, Bourgeois, Goodall, Guild, and Larrivee, plus a number of pre-owned beauties from various builders which they had taken in on trade. After a long afternoon of playing some great guitars, with 5 guitar stands in front of me holding a changing array of wood beauties, I selected "the one", which kept staying in the "maybe" stands. I loved the look and feel of this Goodall, and definitely preferred the sound over all others, and certainly a/b-ed them to really focus on which one might adopt me that day. I know I could have walked out of there without buying that day - you just felt a cool vibe there the whole time. But that Goodall begged me to take her home, and I did. Simply awesome guitar, fine workmanship, incredible tone, great wood, and highest attention to quality I have ever seen. I have bought and sold other acoustics since, and own several now. But this Goodall KGC is the best match for me, and it is not going anywhere. Go find yours (whatever it might be) and I hope you are lucky enough to have a great try-it-out environment where the spirit of the guitar can connect with you. How does the Grand Concert compare in size and projection to a dreadnought? What characteristics did you like about this guitar over the others you played? I was simply floored by the quality of these instruments I played today. I've been playing Gibsons for so long I've gotten kind of used to all the little "quirks." These guitars just reflected complete mastery of guitar building. Every last little detail was flawless. The resulting sound was just astounding. And to consistently put together guitars that just drip with tone . . . unbelievable. It's going to be a fun search. 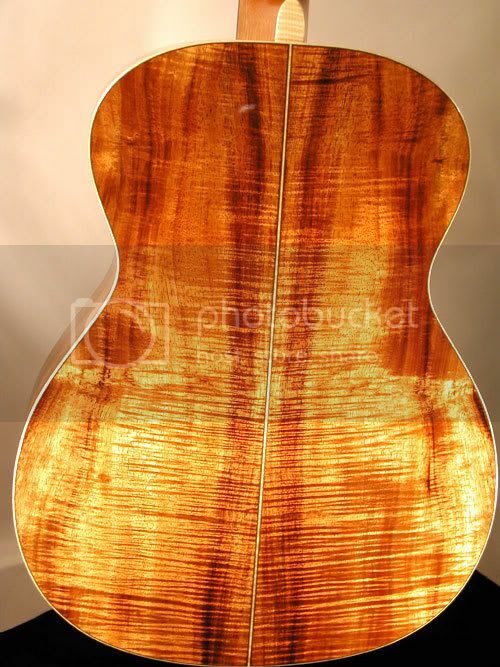 My particular Goodall Koa Grand Concert (KGC) has a clarity and warmth throughout the fingerboard. Sounds equally great with pick or fingerpicking. I felt the sustain of the chords and single notes much more than the others I tried that day. relaxed playing/buying space where every note was the only sound in the room. The grand concert is smaller than a dreadnought and has a tighter waist. It is said to sound less boxy than a dreadnought. so cannot comment on how it cuts through other instruments in an ensemble). project the best - less sustain but crisper attack. a wood which rings warm and sustains, so the KGC was a complete winner for me. and their Traditional Dreadnought is wide 15 7/8", upper bout 12", waist 11 1/4", depth 4 3/4". The tighter waist is the dimension with the largest variance between these two models. action and sonic characteristics, matched to your intended use, in order to find the right one for you. Back in 2000, I did a serious comparison of a whole lot of really fine instruments from smaller builders at McCabe's in Santa Monica. It's another one of those welcoming environments where you can have the chance to let the guitar speak to you. I spent time with guitars by Goodall, Breedlove, Bourgeois, Santa Cruz, Froggy Bottom--they were all stellar instruments in their own individual ways--but when I got to the Collings OM-2H it just felt like home. It's actually the most understated of the group I played over several weeks of return visits, but it was just MY voice, I guess. Anyway, I'm very happy with my choice. Since then, I've played some more killer acoustics, including a fantastic Lowden, a Martin 00028EC that just kills, and a Collings jumbo. I'm happiest with the OM or OOO smaller body style in most situations. Anyway, good luck on finding your own voice. Like others have said, it's important to take your time and really listen to each guitar. Have fun! TJ Thompson, Blazer & Henkes, Jim Merrill, Kim Walker, Julius Borges, Franklin (Nick Kukich), Wayne Henderson, Circa (John Slobod), Roy McAlister, Lynn Dudenbostel, Randy Lucas, Ed Claxton, Kevin Ryan, Jim Olson, Mark Blanchard, Jeff Traugott, Ervin Somogyi, Linda Manzer. And let us know if the game hasn't changed yet again. As far as the Collings go, I am right there with you. I have owned my share of Gibsons and Martins, and still own a number of each. I have also owned two Goodalls (MJC and RW Standard) that I have sold. About 3 years ago I wanted a mahogany dred. Bought a Golden Era D-18 but ended up taking it back. Then, I "took a chance" on a Collings D1A. Now I own 4 Collings acoustics- the D1A, a C10 Deluxe, and OM1A, and a MF5 Deluxe Varnish mando. Love those Collings acoustics. Hi justonwo. You have clearly discovered two of the finest small shop acoustic builders out there! 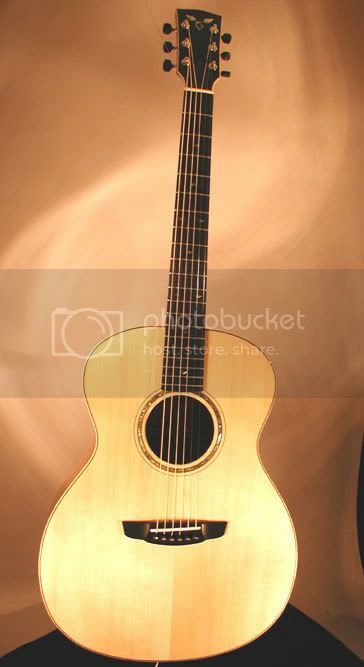 I have owned 10+ Collings acoustics (probably played hundreds! ), around 5 Goodalls, and actually worked in a shop that sold Goodalls. I am a small body fanatic and love the Collings OMs and C-10s-huge guitars for their size! And the Goodall GC is a killer all around guitar imho, and his Parlor is gargantuan! That said, the Collings CJ is hailed by many as the ultimate do-it-all acoustic, and the Goodall CJ and Standard are also remarkable guitars. My favorite Goodall (of the few I've heard and played) was a rosewood back and sides Grand Concert...spectacular. As far as Collings goes, I've played a bunch that blew my socks off including various D1's and D2H's. I never dug the OM2H, preferring Santa Cruz OM's. But, the king of all of the ones I've ever tried was an OM1A. That thing was wonderful and even better in open tuning. If you like dreads, try a Rockbridge if the opportunity arises. You won't be disappointed . I'm not really sure what body shape I'm in to at this point. I haven't really played enough to know. (Particularly the OMs). I need to get out there and play a ton. I've owned two Goodalls, a CJ and a Jumbo. Great guitars, no doubt, but in the end I prefer a 'traditional' sound and I'm a happy Collings owner, an OM1A and a D1A, both are phenomenal guitars. Prior to these two I had an OM2H and a D1. There is something very alluring about the Adirondack/mahogany sound.....crisp, immediate, plenty of headroom when I dig in. In the end, it's a very personal decision......try as many as you can before taking the plunge! From what I understand, Adirondack can be a bit stiffer than Sitka, which means the top can be made a bit thinner if desired. Less mass = easier to get vibrating = more sound. The D1A comapred to the D1......bigger deeper crisper basses with the D1A, both guitars had plenty of top end shimmer. In general, rosewood vs mahogany.....more overtones with RW, a 'drier' sound with more of the fundamental with mahogany. I liked the OM2H I had, but when I played the OM1A, it was more immediate and direct which really sounds great for fingerstyle (in addition to flatpicking), and I just had to have it! The dread has *much* more bass than the OM......the OM is more midrangey. Here is a recording with a female vocalist. The dread starts off, the OM is the 2nd guitar added for "color". BTW, the sound of the dread is not super accurate in this recording, in real life, it has much more low end.